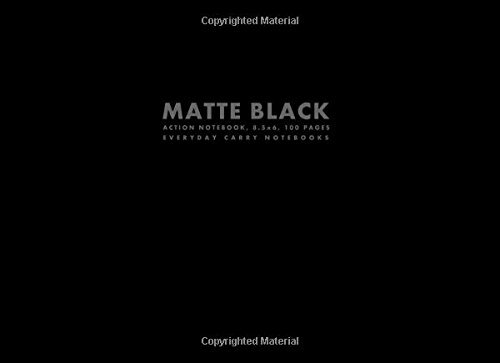 The idea behind EVERYDAY CARRY NOTEBOOKS’ Matte Black Collection is as simple as it is true: different callings, vocations, activities and undertakings demand different notebooks. AFFORDABLE: Every 100 page EDC Notebook is priced the same, regardless of type or form factor. Price won’t stop you from finding the notebook that best fits your needs! SKETCH NOTEBOOK. A blank/plain paged notebook without any grids, lines or dots to get in the way. LINED NOTEBOOK. A traditional ruled/lined paged notebook suitable for any kind of writing or notetaking. GRID NOTEBOOK. A squared/graph/grid paged notebook featuring a 5x5 grid (five squares per inch). DOT GRID NOTEBOOK. A notebook with pages featuring a 5x5 grid set out by dots rather than lines. GREY GRID NOTEBOOK. Reverse the polarity! A squared/graph/grid paged notebook featuring a 5x5 grid (five squares per inch) set out with grey squares and creamy lines. DOT GREY GRID NOTEBOOK. Reverse the polarity! A notebook with pages featuring a 5x5 grid (five squares per inch) set out with grey background and creamy dots. ACTION NOTEBOOK. Get stuff done! Every lined page in the Action Notebook is checklistable times two. Use this unique notebook to take notes, make action lists, to-do lists, or checklists! Use the blank boxes at the top of each page to highlight important/special information! JOURNAL NOTEBOOK. Start journaling! Keep a record of your life, your work, your family, your world, your business! Anything! Use the blank boxes at the top of each page to highlight important/special events or ideas! UN/STRUCTURED NOTEBOOK. IN THE FRONT: 75 plain/blank/unstructured pages for free-form ideas, thoughts, notes and sketches. IN THE BACK: 25 structured pages for action/check lists, contacts, year, month or daily schedules, long lists and short lists. STORYBOARD NOTEBOOK. Visualize your story! At the top of each page: title, date, and page no. Above each frame: room for scene number, shot number and frame number. Below each frame: there is room for a frame name/caption. For Storyboard Notebooks sized 6"x6" and up, there is also room for notes next to each frame. Look inside! EDC NOTEBOOKS are designed to be at your side and at the ready 24/7. They are highly portable, you know, depending on the form factor your busy life demands and, naturally, the size of your pockets, purse, bag, or briefcase.